Welcome to Bright Beginnings! Bright Beginnings Preschool is a licensed Community Preschool, open to children 30 months to five years. 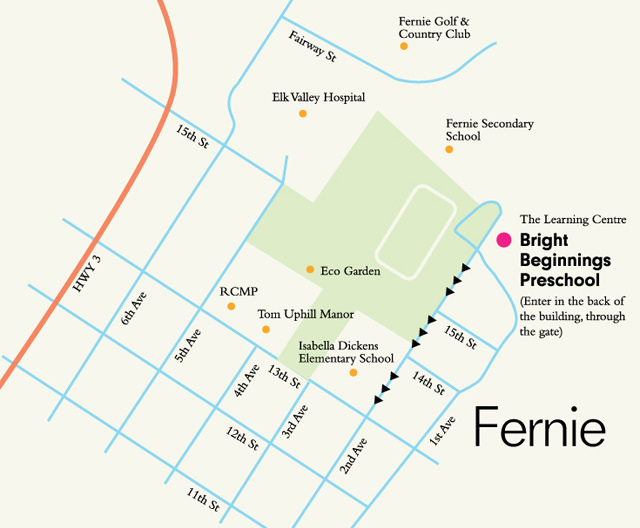 It is the only not-for-profit preschool in Fernie and relies on parent volunteers and fundraising to keep fees low. This allows us to provide a preschool that is accessible for all families in the community. Look around and find out more about our amazing play-based learning centre. Stacey Mcintyre and Jenna Harrad, both born and raised in Fernie, are our beloved Bright Beginnings ECE teachers. They both believe in the power of play, the importance of being outside and getting involved in the community. Read more here: Our Philosophy. Bright Beginnings Community Preschool lives at 1601 2nd Ave, at the back of the building. For more contact information, go to our Contact Us page. Read more here: Registration and Fees.